The Latvian capital city Riga has finished fifth in the competition for the European Best Destination 2018 title, Anna Blaua, a representative of the Riga Tourism Development Bureau (RTAB), told LETA. The Riga Beer Quarter, which opened in the Latvian capital city yesterday, is intended to become a new tourist destination, communications adviser Agnese Ruberte told LETA. The number of nights spent by guests at Latvia’s hotels and other tourist facilities in the first eight months of this year grew by 12.2% against the same period last year to 3.524 million, writes LETA, according to the data released by the Central Statistics Bureau (CSB). 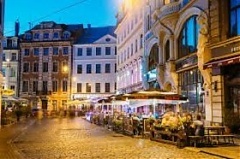 There are currently 491 certified tour guides operating in Riga, LETA was informed by the Riga Tourism Development Bureau spokeswoman Edgars Mikelsons.